It’s one of the most important days in your life: your wedding. And you want to document it, to have a treasure trove of memories to look back on without flaws. A marriage movie you can watch again and again. Most people have no idea how to go about finding that perfect wedding videographer or what to ask them. Take a look at our top 10 questions for wedding videographers to help you meet the videographer who will highlight the best of your wedding moments. 1.) What sets you apart from the hundreds of other wedding videographers in my area? This is asking for more than a sales pitch; it involves personality and expression. If they seem as if they’re reciting their wedding videography resume from a script, or get offended, it can tell you a lot. 2.) Can you describe your style of wedding videography and what to expect? A quite important aspect of videography is individual taste and style. Pay attention to their description of style methods (i.e. cinematic videos are organized and edited to tell a story; a documentary style captures moments throughout the day); do they have an invasive presence; how they do lighting and sound; how many videographers; which parts of the wedding are shot; and what they prefer doing in postproduction. It helps you to see if you are on the same page of wedding video expectation. 3.) What is included in the wedding video package and how is it delivered? Many videographers have package deals, which might include both raw footage and the edited final copy. Delivery can be done via DVD, USB or online, depending on your preference. 4.) What are your wedding videographer qualifications? To seed out the cousins of a friend who are ‘hobbyists,’ asking for credentials is fair for you to ask. It is your wedding and you deserve a professional to document your special day. 5.) Can you give me recommendations from other weddings? An insight into the person can let you get to know if they’ll film your wedding the way you need. 6.) How do you edit the wedding videos in postproduction? There are typically 3 ways that are popular at the moment: clean, or straight shooting; documentary style; and cinematic, which uses overtly vivid colors, effects and artistic editing. Ask about how they handle the sound and background music, which is a large component of a good video. 7.) What does your videographer’s price include? You can’t get the same quality from a videographer who just takes simple footage. It’s up to you what you’d prefer for your wedding. 8.) Can I see (or can you send me) a wedding video that is similar to what I want? Wedding videos are important for the simple reason you can see if the videographer is good at compilation, or stellar at capturing a wedding’s unique personality. They don’t always go hand-in-hand. A videographer can be great at shooting time-lapses, but shoddy at shooting a wedding day. You can also see if the videos reflect the particular wedding or the love story of the couples, or if they all appear to be the same film repeated. Again, it depends on your preference for your own wedding. 9.) Could you tell me about one of your favorite/worst weddings you shot? This can show how much the videographer invests in weddings, generally. It can also give you a heads up on personality, and how well the videographer will mesh with you. It’s important, since you’ll be at one of your most stressed-out moments and they’ll be recording you every step of the way. 10.) How do you deal with disappointed wedding clients? Even if there’s a contract, any discontent on either side needs to be addressed before the wedding. Finding out how well they deal with unhappy clients can aid you in making a decision. 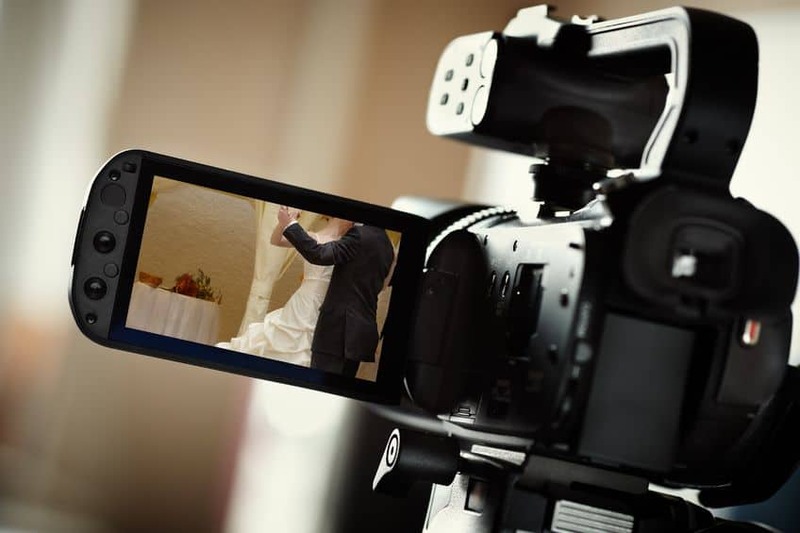 We hope this top 10 list of questions for wedding videographers has been useful for you. To discuss filming or live streaming your wedding, email info@redshellproductions.co.uk or phone 0121 6677 898.